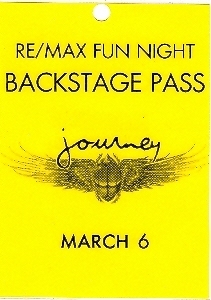 This is a Backstage Pass from a private performance of Journey at the MGM Grand in Las Vegas, Nevada, on March 6th, 2008. Journey the rock band from San Francisco California and new Vocalist Filipino singer-songwriter and currently the lead singer: Arnel Pineda. Pass is about 4 X 5 1/2 inches, in very good condition. Buyer responsible for 1.95 postage within the USA and Canada. Please email for more details. Thank you for checking us out!